Unsolicited samples can be a double-edge sword. On one hand, hey, free hooch! On the other, if you’re just not into it, then what? 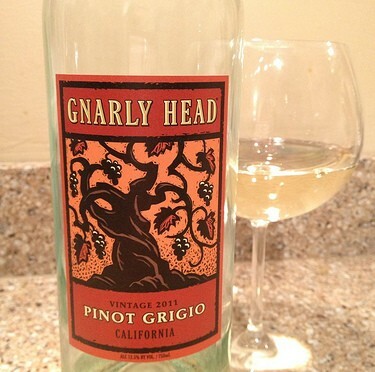 I was oh so happy to be pleasantly surprised by this Pinot Grigio by Gnarly Head. They make a mean, chewy Zinfandel, one I adore with spicy BBQ. http://bit.ly/VzpPHp /Ravenswood & Gnarly Head Zinfandel But hey, you couldn’t expect the Mack Truck folks to create a cutesy, sporty, two-door Mini Cooper, right? This light, crisp white varietal seemed like such an unlikely departure. Alas, it totally works. This Pinot Grigio is what fans of Pinot Grigio are looking for. This wine is light and lively. It is crisp and tart with flavors of lemon. Are you making anything with lemon butter? Pair it with this Pinot Grigio. A light, herbed citrus chicken? Pair it with this Pinot Grigio. Hitting up the Chinese take out after work for some Kung Pao Chicken? Do it to it (just add Gnarly PG).